A hand painted unhealthy foot replica to help teach the importance of proper foot care and nutrition to people with diabetes. 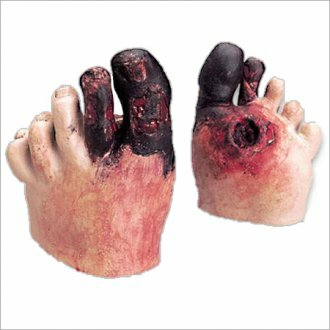 This Life/form® foot replica shows the distal end of the foot with an invasive wound on the bottom of foot and surface inflammation around the big toe and second toe. Life-size foot constructed of soft, lifelike material with flexible toes. Also includes a 4-page, 5-1/2" x 8-1/2" booklet providing information on diabetic foot care.